Discreet yet stylish, the D.I. Case is the handiest carrying case available for transporting your insulin and syringes. Simulating a designer eyeglass case, the D.I. 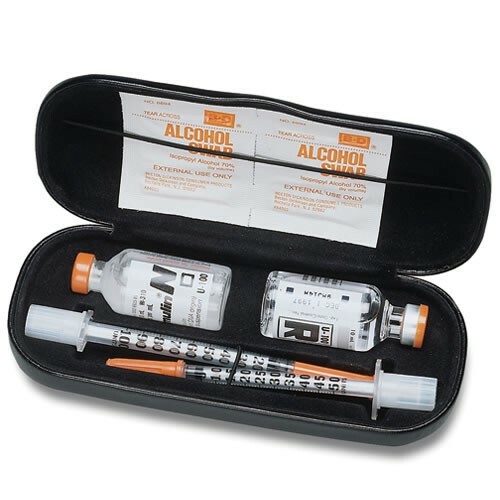 Case is made of lightweight aluminum with a fitted insert that holds two vials of insulin, two syringes and alcohol swabs. Also compatible with the smaller, 100 unit, prefilled disposable Pens. Fits comfortably in your pocket or purse. Weighs only four ounces. Comes in simulated leather and a fashionable variety of colors. Perfect for everyday use. I love this case for 20 years. I have had this case for more than 18 years. I need a new one now. I'm not looking at any other styles, I love this one. After all this time, I just use a rubberband to keep it closed since the spring-loaded clip sprung. I also lost the elastic bands for syringes and pads years ago. No problem because I'm not packing pads and the syringes stay in place. Just now the plastic insert is peeling, cracking, and falling out. But I live in Tucson and the heat is terrible on all plastics. I LOVE THIS CASE.